You can trust a piece that’s too personal to proselytize, and, through depth of feeling, achieves more universality. The performance was quite fantastic. 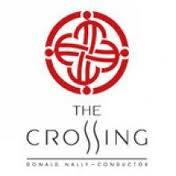 I am in awe of the musicianship of The Crossing’s singers and of the skill with which Donald Nally (the group’s artistic director) can elicit the formidable best that they can give. It didn’t hurt that many of the singers were performing the piece for a second time. It was good to hear the piece in Chestnut Hill Presbyterian, a less drastically resonant space than The Icebox where the premiere took place. You can see the video of last year’s premiere of the piece at this site’s video page – go to the link above. 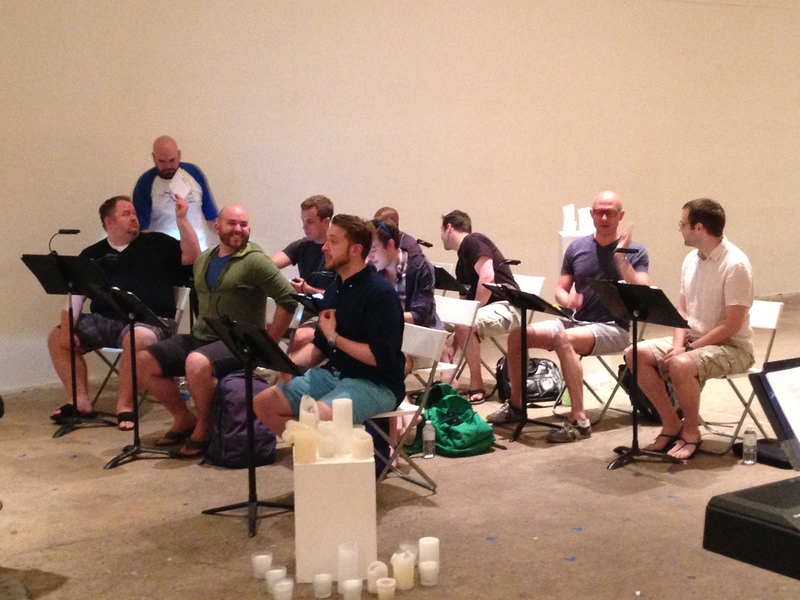 The Crossing, Philadelphia’s extraordinary new music choir, has just announced its 2014-15 season, and I am happy to say they will be reviving my Mass for the Day of St. Thomas Didymus, which they premiered this past summer. 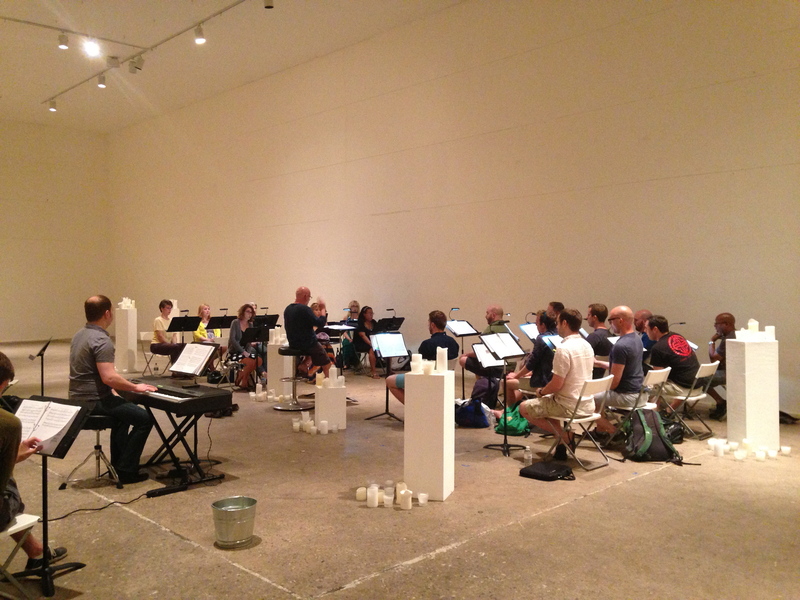 The date is Sunday, June 21, 2015, as part of the group’s annual Month of Moderns festival – more info about the program here. You can see video of this past June’s performance by choosing the video link above. There are several posts about the piece below; perhaps start with this one. You can find more posts by clicking on “The Crossing” in the tag cloud found in the sidebar on the right. Many, many thanks to all the singers and to Donald Nally, the conductor for their fantastic work on this piece. Read more about the Mass here, here, and here. – It was a fantastic performance by The Crossing last Saturday. I thought my new Levertov Mass went very well, and the audience was warmly appreciative. I’m deeply grateful to every member of the group, especially those who performed the demanding “schola” parts – a quartet of singers positioned behind the audience – as well as the several singers who took on brief solos in the main choir, in front of the audience. Donald Nally prepared the performance with meticulous care, and the level of musicianship of all involved was quite dazzling. UPDATE: go here for the Philadelphia Inquirer review of the concert by David Patrick Stearns. 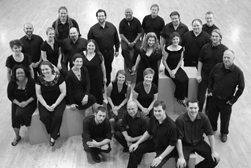 – You can read an article here about the Westminster Choir College CoOPERAtive program, which will include a reprise of this spring’s Lyric Fest concert that includes my Waltzing the Spheres. Laura Ward will again be the pianist, while Kelly Bixby will be the soprano. – There are eight Philadelphia Orchestra concerts at the Mann Center this summer – but five of them are either movie play-alongs or pop concerts, and a sixth is mostly given over to spirituals. The latter does have a premiere by Uri Caine, nice to see some new music being done. But only two entirely classical programs? UPDATE: a brochure just came in today’s mail for two July programs with the Philadelphia Orchestra – “Pixar in Concert” and “Classical Mystery Tour: A Tribute to the Beatles”. By the way, on the days that Philly will present “Pixar in Concert”, the Mostly Mozart Festival will present a John Luther Adams premiere. 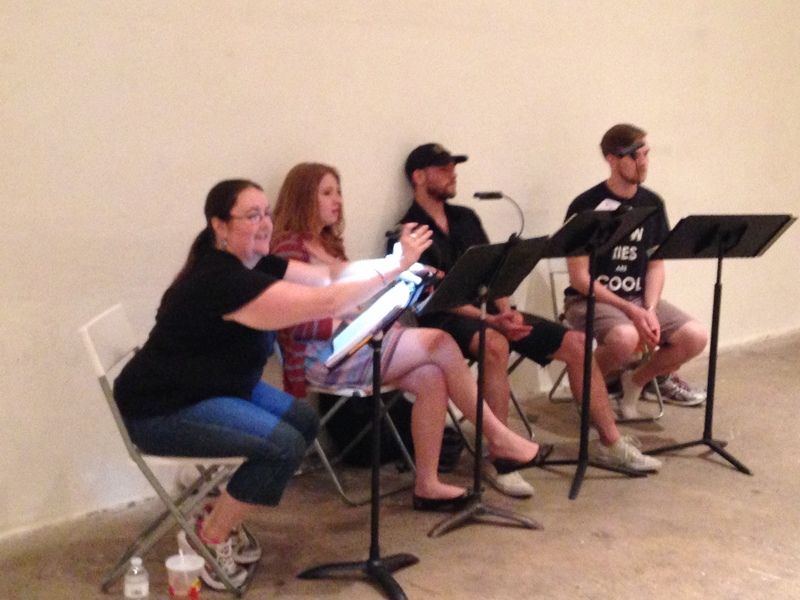 The Crossing rehearsed my Mass for the Day of St. Thomas Didymus for the first time in The Icebox at Crane Arts yesterday. The space is a huge, very high-ceilinged plain white rectangle that was, so I am told, a meat locker. (Why on earth did a meat locker need to be so big, especially so tall? Were they storing cuts of dinosaur meat? Godzilla fillets?) The room is unusually resonant; cut off a loud chord, and you will still be listening to it 6 or 7 seconds later. It takes a little getting used to when you first hear the choir in there, especially if the music is something other than slow. Crossing Music Director Donald Nally wisely moderated the tempo in the faster portions of my piece, and I think the unavoidable – and in some passages desirable – blurring of the sound will not be a problem. 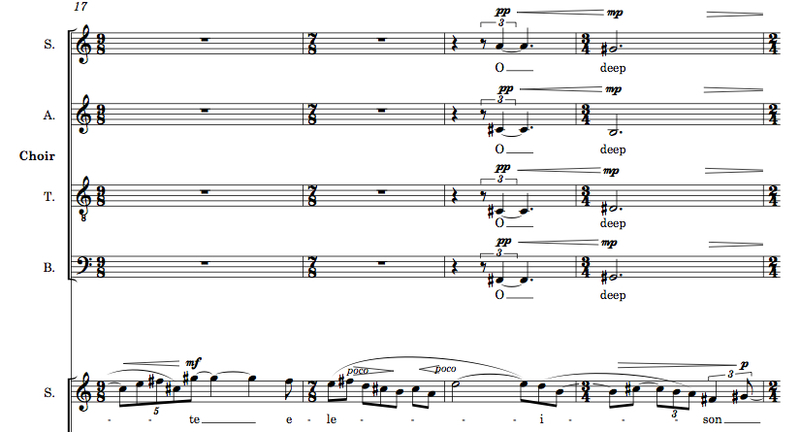 The separation of the two choirs in my piece worked well, with the quartet and main choir on either side of the room across the shallow dimension. I take it the audience will be between the two groups. The musicianship of The Crossing’s members is quite extraordinary, and the many short solos in my piece are being beautifully handled. Donald Nally is a highly efficient, meticulous conductor whose sympathy for the piece is apparent at every moment. I’m deeply grateful for everyone’s efforts. 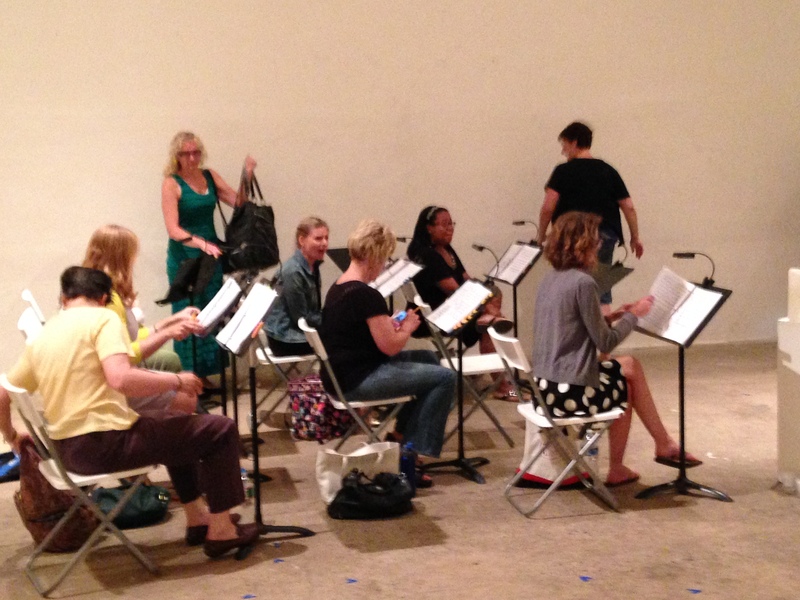 I hope to see you at this Saturday’s performance: June 28, 7 pm, Crane Arts, 1400 N. American Street, Philadelphia. I was excited to receive over the weekend the schedule of rehearsals for The Crossing’s performance of my St. Thomas Mass on June 28 at The Icebox here in Philadelphia. While the last rehearsal is specifically identified as a session that I will coach, I will attend all the rehearsals. Conductor Donald Nally has been offering positive comments on the piece. He also told me – regarding attending the first rehearsals: “Just be warned, I tend to wrestle pieces to the ground in the first rehearsal or so….then they get back up and start dancing a little.” I’ve heard The Crossing make pieces dance on several occasions, and I know they will bring this piece to vivid life. Today I sent conductor Donald Nally a PDF of the complete score for my piece commissioned by The Crossing, Mass for the Day of St. Thomas Didymus. I posted a program note about the piece here, but I thought I would say a little more in this post about how the piece is put together. My Mass is scored for both a full SATB chorus and four SATB soloists forming a semi-chorus or schola. While the work can be performed with the two groups arranged antiphonally, this is not absolutely necessary. In fact, the rhythmic coordination of the two groups is probably too tricky to permit the schola to be placed in a distant gallery of a church far from the main choir loft. Still, a certain degree of separation will be desirable. I am told The Icebox, the performance space here in Philly where the work will be premiered, is extremely reverberant, so it is unlikely that we will be able to position the two groups very far apart. 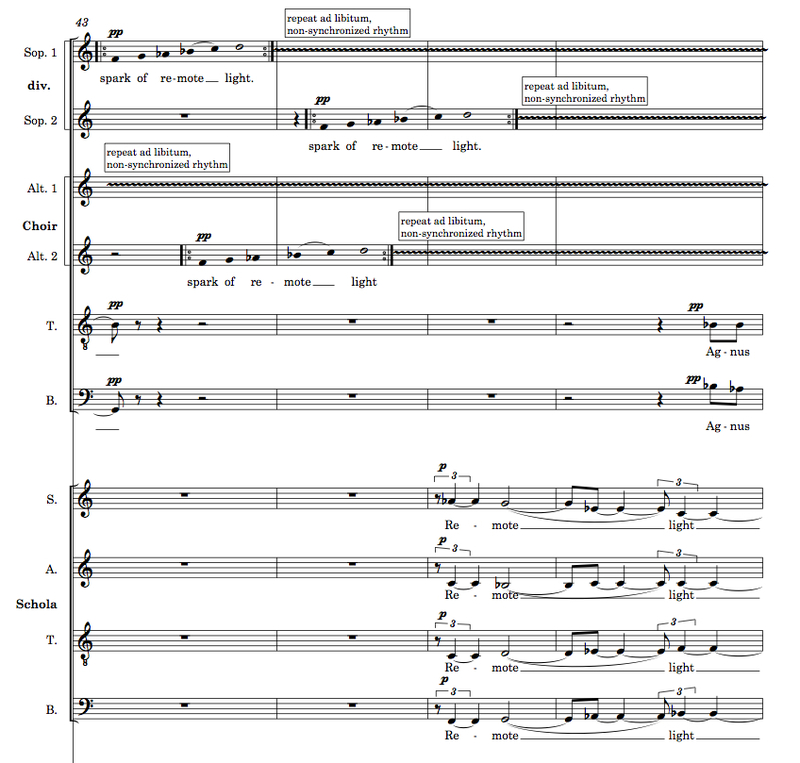 There are plenty of precedents for antiphonal choral music, but the special issue at play here is how the texts for the work are divided up: the schola sings the Ordinary of the Mass (Kyrie, Gloria, Credo, Sanctus, Agnus Dei) in Latin, while the main chorus sings excerpts from Denise Levertov’s cycle of poems “Mass for the Day of St. Thomas Didymus”. Rather than something like the Monteverdi Vespers where the antiphony is used for echo effects, here the two groups are articulating different texts, using musical gestures that more often contrast with, rather than echo each other. The model is obviously the Britten War Requiem, with its Wilfred Owen poems sung by tenor and baritone soloists while a choir and boychoir sing the Latin Mass texts. 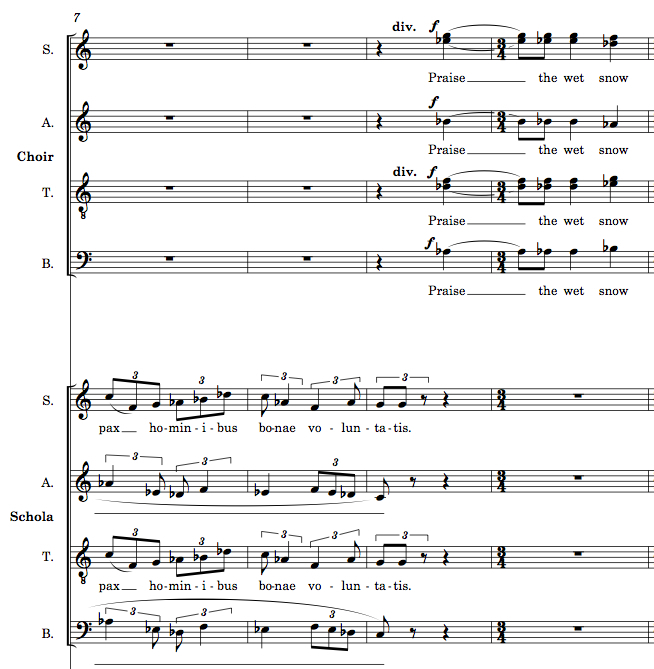 The schola in my piece is further distinguished from the main choir because its music evokes various liturgical idioms while the full choir usually does not. For example, the piece begins with the schola singing the Kyrie in a melismatic plainchant style. As the chant continues, the choir gradually unfolds the first words of the Levertov – “O deep unknown” – in sustained four-part harmony. These four chords return in varied forms in every movement of the piece, and there are melodic gestures derived from them as well. The compound meter and open fifths of the schola’s music for the Gloria suggest medieval organum; the choir sings in block polychords, using simple meter to increase the contrast with the smaller group. Actual liturgical music is quoted in the Credo. The schola sings excerpts from the Creed set to phrases from the Bach chorale Wir glauben all’ an einer Gott. 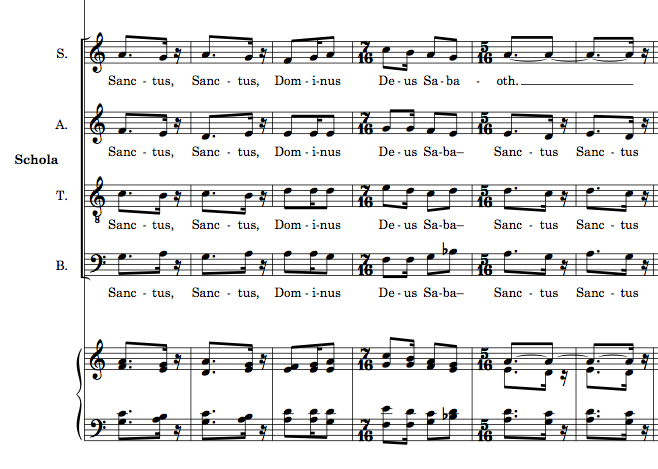 Since the German text of that chorale is a translation of the Creed, I have simply “Romanized” the Lutheran tune! I have also extracted only a few phrases from the Creed, not to be theologically selective (the so-called “cafeteria Catholic” syndrome is not at play), but because setting the entire Nicene Creed in chorale style would be impossibly long in this context. Soloists from the main choir begin the Sanctus with the Levertov text. 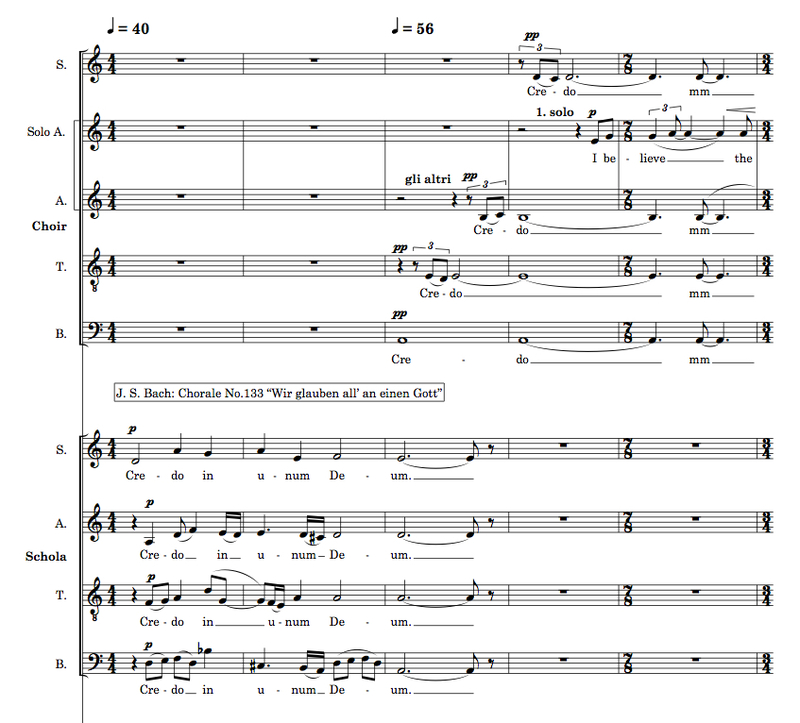 In this movement there is a kind of private quotation: when the schola enters, the music it sings is based on a much simpler setting of the Sanctus I wrote many years ago for the choir of the Catholic Campus Ministry at Columbia University. That piece was influenced by the rhythms of Bernstein’s Chichester Psalms and Mass (the latter piece perhaps influenced in turn by the Poulenc Gloria), as well as being based on a chant melody – so there are multiple layers of reference at play here. 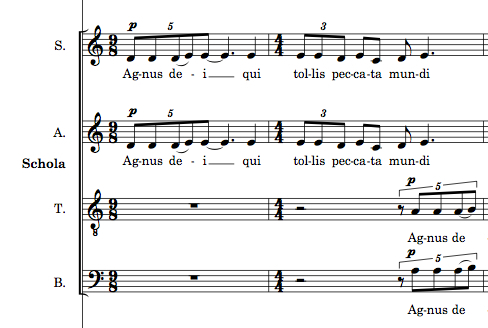 The Agnus Dei begins with a simple traditional plainchant setting of the Latin, which returns at the end. At last the two groups join together, with the schola singing the “”O deep unknown” chords that have recurred throughout the piece, the women of the choir repeating the last line of the Levertov in non-synchronized counterpoint, and the men of the choir chanting the Latin text – this is the first time in the piece the two groups have swapped languages. To close, the two groups sing the chant in unison. Musically binding together all the musicians in this way is a strategy borrowed from the closing pages of the Britten. I’ll surely be writing more about the piece once rehearsals get going. Perhaps I can coax Donald or one of the singers to do a guest post about working on the piece. Remember that the premiere is June 28th at The Icebox in Philadelphia, 7:00 pm. It is a lucky month for me with respect to my choral music. I’ve already posted about how Emmanuel Music will do a new motet this coming Sunday; but in addition, The Crossing, Philadelphia’s extraordinary choir devoted to the music of our time, will do my Spiralling Ecstatically at concerts in Philadelphia and New York in the days before Christmas. Donald Nally will conduct. Both Emmanuel and The Crossing are quite superb, and I am looking forward to some great performances. The piece originated in a setting I wrote for the choir of the Catholic Campus Ministry at Columbia University some decades ago. I subsequently re-wrote the piece for Emmanuel Church in Boston, where it was done most recently at the installation of their pastor, Pamela Werntz. Congratulations to The Crossing’s conductor, Donald Nally, who recently joined the faculty of Northwestern.